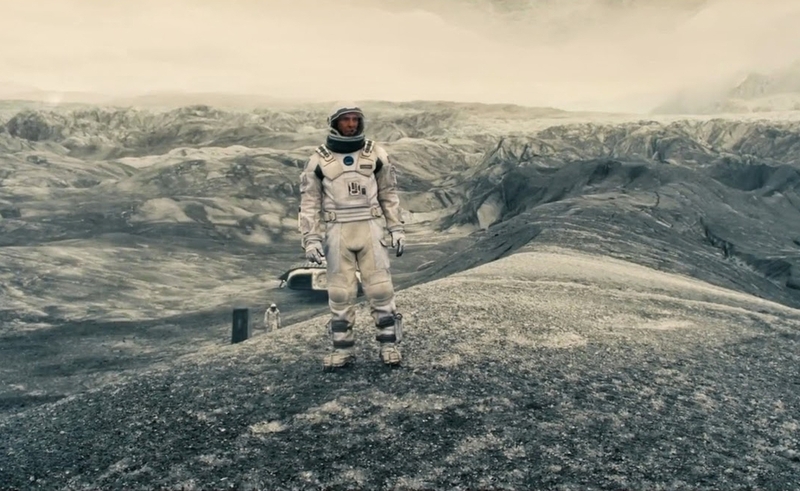 At the beginning of Interstellar, Christopher Nolan’s ambitious-and-then-some new science-fiction movie, the lights have started to dim on Earth. Some unspecified cataclysm related to a devastating world war has thinned the populace and thrown the globe out of balance, introducing a new, worldwide dust bowl and a blight that’s driving plant life to extinction. Wheat is gone. Okra is on its way out. Soon all that will be left is corn. Yet life goes on for those who’ve held on, albeit at a slower pace, and with a new focus on farming. A widowed father of two, Cooper (Matthew McConaughey) trained his whole life to travel beyond the clouds as a NASA pilot, but a devastating crash and the new agrarian order have left him earthbound as he and his father-in-law (John Lithgow) raise his son Tom (played as a teenager by Timothée Chalamet), who’s content to move on to a life on the farm, and 10-year-old daughter Murph (Mackenzie Foy), who isn’t. Like her father, she has an eye trained on the sky and what might be found there. She even gets suspended for bringing an old textbook to school that contains the story of the moon landing, instead of the new, official version of how the U.S. faked the Apollo missions to bankrupt the Soviet Union. Like her father, she belongs to a more adventurous past, or a brighter future. The present isn’t made for them. That’s also true of Interstellar, a film as stylistically bold and in love with cutting-edge special effects as it is old-fashioned. Nolan’s script, co-written with his brother and longtime writing partner Jonathan, often plays like an attempt to bring science fiction back to first principles: What’s out there? What does the future hold? How will it reshape us? And what lies not just on the horizon, but beyond it, in the places we not only can’t see, but can’t even imagine? The Nolans fill the film with references to Stanley Kubrick and Arthur C. Clarke’s 2001: A Space Odyssey: episodic structure, echoes of its soundtrack in Hans Zimmer’s stirring score, images of mighty spacecraft looking fragile and tiny when placed in front of mighty galactic bodies in the silence expanses of space, a final blurring of science and mysticism. Yet James Cameron’s 1989 film The Abyss seems just as likely a model. Like that movie, Interstellar attempts to balance hard science and a soft heart. And, also as with The Abyss, the balance often eludes it. Murph complains her bedroom is troubled by ghosts, but Cooper is too much a man of science to entertain that kind of suggestion. Together, they look for an explanation as to why the books sometimes fall off her shelf for no apparent reason, and why the dust settles in clear patterns. Determining that they’ve been given geographical coordinates by forces unknown, they set off to see what’s there, never expecting to stumble upon what remains of Cooper’s old NASA employers, including Professor Brand (Michael Caine), a genius physicist he worked with in the old days, and Brand’s daughter Amelia (Anne Hathaway), now Brand’s equally determined assistant. Sensing Cooper and Murph mean them no harm, and can ultimately help them, the Brands bring them into a well-kept secret: NASA has spent years working in secret on a way to rescue the human population from an Earth they know is doomed. They’ve even sent some brave explorers through a wormhole to find habitable planets, and they feel optimistic about the results. They just need a crew, and a capable pilot like Cooper to check on what they’ve found, even if this means not returning to Earth for years—if ever. What happens next is best discovered on Interstellar’s terms, though those who have seen the film will have a lot of questions and should head to The Reveal to discuss them. In short: It’s a lot, as if the Nolans felt compelled to pack the film with every science-fiction device and concept they ever wanted to explore, from a witty robot (named TARS, and voiced by Bill Irwin) to the mind-bending implications of relativity to philosophizing about human nature. The generous running time gives Interstellar ample space to explore whatever it likes, but the film doesn’t always use that space well. Concepts get explained and re-explained, and characters get established, then established again, through here’s-what-this-guy’s-all-about dialogue that’s a couple of rewrites away from sounding natural. It’s as if the Nolans heard some of the complaints directed at Inception and decided to double down: Interstellar often seems afraid to let any development go unpacked and uncommented upon, except for a handful of points that dive into the action and expect viewers to catch up. The film is at its best in these moments, when it’s unafraid of challenging storytelling, particularly since Interstellar never has trouble finding visuals to match its heady concepts. The Nolans’ latest feels more comfortable when it heads to the rings of Saturn, settles into the alien landscapes of faraway worlds, and plunges into the cosmic unknown than it ever does when pausing to lay out what it will take to move from Point A to Point B. Late in the story, Interstellar abandons all timidity, and as the score starts striking ominous notes and the action mounts on three separate planes at once, it becomes a fleeter, more Christopher Nolan-like film than it had previously dared. That makes it easy to wish for the more daring, propulsive film that might have been. The movie we got is still remarkable. Nolan fills the screen with extraordinary images, on Earth and in the heavens, and McConaughey gives it a much-needed center of gravity. Ultimately, Interstellar owes as much to Homer’s Odyssey as the one Kubrick directed: McConaughey plays Cooper as a hero driven by a need to explore, yet yearning to return home to those who need and love him. The later sequences movingly portray how much distance he’s traveled and the damage his absence has exacted on those he’s left behind, both by traversing that distance and by lingering on McConaughey’s face as he takes stock of where life has taken him. He delivers a deeply affecting performance, one he couldn’t have pulled off if he were afraid to make himself look vulnerable. He does eloquent work in the midst of a beautiful, admirably overreaching, often ineloquent movie. His performance nails what the film around it can never quite express as well as it wants: that however far we might go in the cosmos, our humanity, with all its lovely, tragic, defining needs and weaknesses, will always travel with us.